MANILA, Philippines — After announcing that he was waiting for the right time to resume talks with the communists, President Duterte claimed that four in 10 of the rebels are gay. “Alam ba ninyo 40 percent ng NPA ngayon na sundalo bakla? 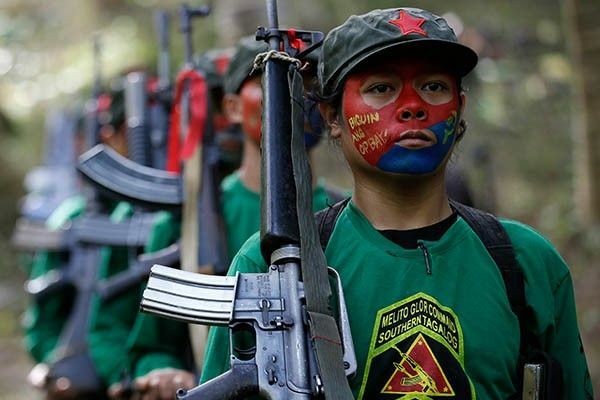 (Did you know that 40 percent of NPA fighters are gay? ),” Duterte said during a campaign sortie of the PDP-Laban in Laguna last Saturday. “Nagtaka ako bakit sabi nila si Baste talaga ibigay nila ‘yung sundalo na bihag nila... si Baste pala ang gusto ng mga g*** (I was wondering why they wanted to turn over the captured soldiers to Baste... It turned out, those fools were after Baste),” he added. Duterte did not provide details about the release but previous reports said two soldiers and six militia men were turned over to Sebastian and former presidential aide Christopher Go in Agusan del Sur last Tuesday. Duterte then claimed that four NPA rebels kissed his son. “Pagdating sa bukid, dinala ako ng apat na NPA doon sa niyogan. Gihalik-halikan ako tapos ‘yung lahat... (Four NPA rebels brought me to an area filled with coconut trees. All of them kissed me),” the President quoted his son as saying. “Ah, inano ka pala. Inabuse ka. Sabi niya, ‘Oo, lahat nakahalik.’ Okay ‘yan, makatikim ka rin ng halik ng bakla, mas masarap. Eh malandi ang p***!” (So you were abused? He said, ‘Yes, everyone kissed me.’ That’s okay. You now know how it feels to be kissed by gays. It feels better. That flirt)!” he added. Duterte did not cite any proof to back his claim that close to half of NPA rebels are gay. The President has been resorting to unfounded claims to hit his critics. Last December, Duterte claimed that 90 percent of Catholic priests are gay but did not offer any evidence to support his statement.